Working with the Yeoman Felting Wool at summer camp was great, and inspired me to continue experimenting after camp ended. It’s fun to make detailed colorful designs, which I loaded using img2track software and a hacked cable. 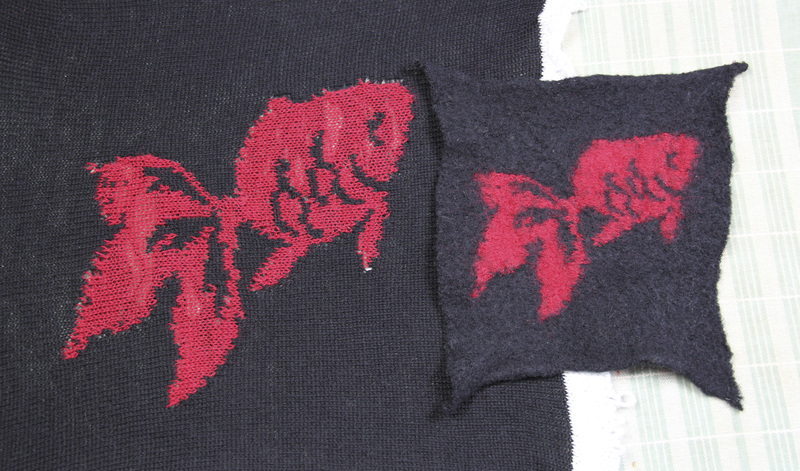 The designs I used are “single motif”: the pattern does not repeat and the contrast yarn stitches are wider than 5 stitches in a row. This results in long “floats” of yarn on the back side. 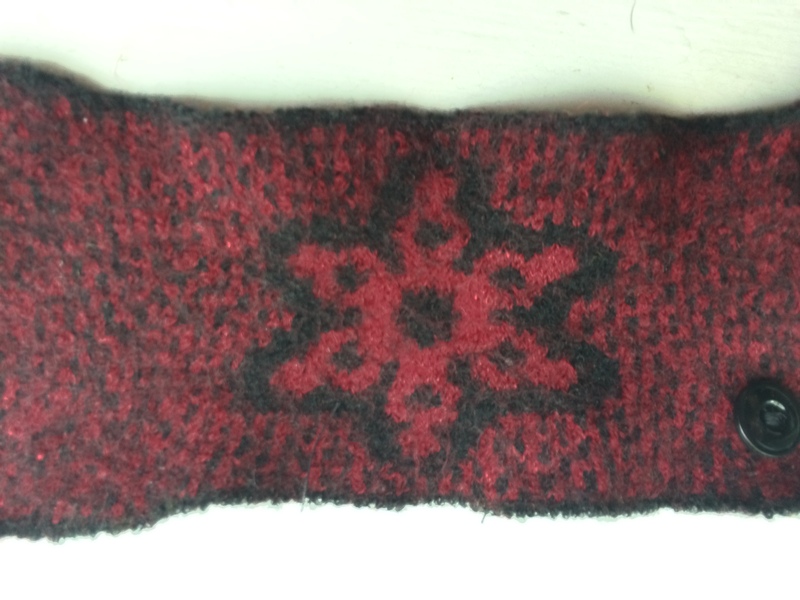 Normally you’d “wrap” the edge needles while you knit to avoid big gaps caused by the edge stitches “laddering.” Instructions for this are often included in machine manuals under “how to knit single motif”. 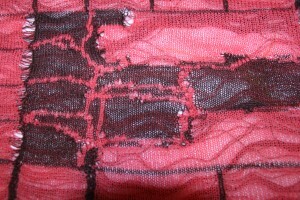 Most gaps disappear completely in the felting process, except those along a straight line that runs along a column of stitches. This is visible below. I think a quick basting and/or a little more felting would fix it. In the future, I plan to try wrapping edge needles wherever there are long vertical lines. However, the pattern itself plays an important role. If there are floats behind the knitting, the stitches will felt faster because they are felting to the fibers underneath. 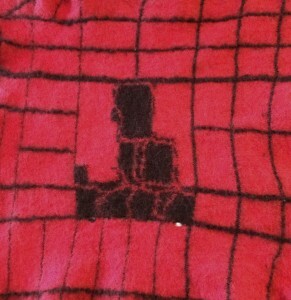 You can see this on the back of this piece. The pattern of the fish, at the top of this post, has long, black floats behind the red fish. The floats felted in place but as the felting advanced, the black started to bleed through, becoming visible on the body of the red fish. 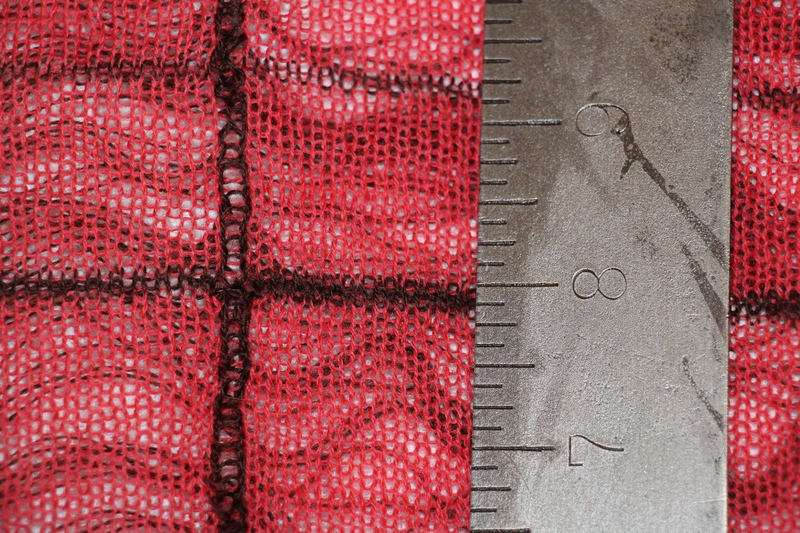 Also small details of the design (like the fish scales) become blurry as colors blended together across the surface. I fixed this on another piece with a razor. Once the piece was dry, I lightly shaved off some of the blurry layer to reveal the details. Be very careful with this– it’s easy to nick a hole in the piece. This is a map of the lakes and ocean near a coastline. I wanted to avoid the beige floats bleeding through into the ocean on the right side. So I did a light felting by hand to keep everything in place, then cut off the long floats behind the ocean portion. Then I put it in the washer on hot for 6 minutes. The result: a bright blue ocean but… the ocean did not felt as tightly as the rest of the design. The solid blue felted less than the speckles of lakes. The floats created by the contrast yarn causes more felting, especially in the areas with lots of really small lakes. 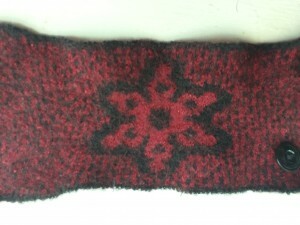 The edges always felt less, because those stitches have less wool to grab onto as they felt. To compensate, I added a 2-color border at each end, in a tiny, repeating pattern, full of short floats. It felted nicely, except for those darn corners! I may try trimming them off in the future. I’d also like to try basting the ends together, felting, and then cutting them apart. 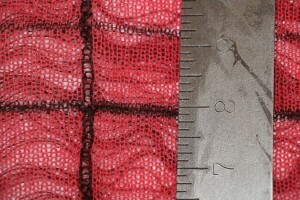 For basic instructions, check out TECHknitting. I also used the book Uniquely Felt by Christine White. 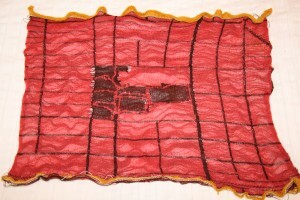 She focuses on felting roving –unspun wool– but I still found it useful and detailed. I used the method of putting the knit in a tub of very hot water, adding dish soap, and rubbing the wool between my hands. It also helped to sandwich the knit between layers of a plastic bath mat. 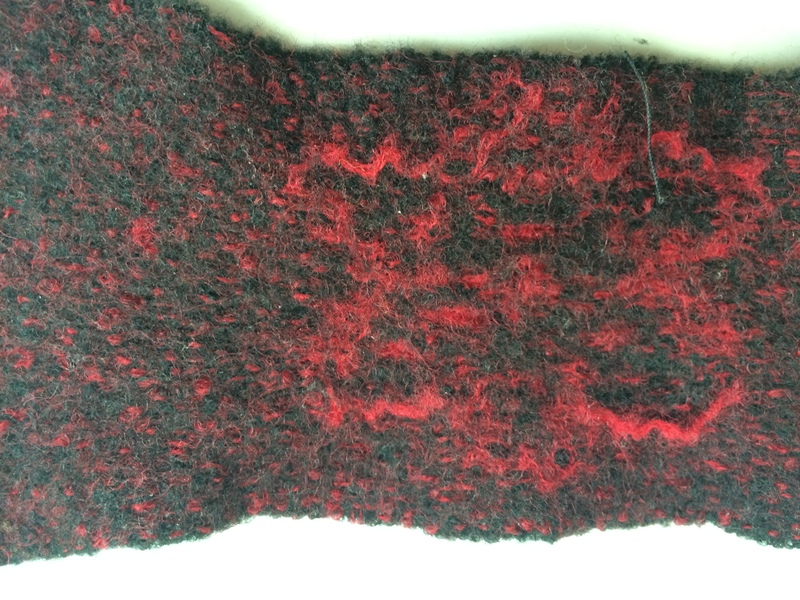 I usually felt once, let it dry, remove waste yarn, then felted at least once more. All the pieces were made on a Brother 930, T2, with img2track software to upload the images. I used waste yarn and ravel cord for casting on and off. Both were removed after the first felting. I knitted these pieces single stranded, which creates a very loose knit, even on T2. 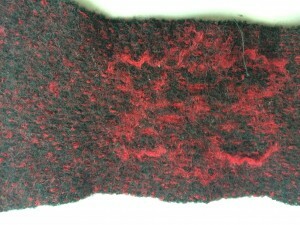 Knitting double stranded also works, and felts much more easily, but shrinks less. Be aware of this if you are mixing double and single stranded in the same piece. Yeoman felting wool is available in 15 colors.